Preben Ormen was born in 1953 outside of Oslo, Norway where he spent his first seven years in a small seaside community after which the family moved to the north end of Oslo proper. After high school, he completed his national military service in the Royal Norwegian Artillery where he trained as a communication platoon leader in a motorized artillery battery attaining the rank of sergeant. He then went to Canada for a BA in business administration and later, an MBA. His work career in Norway, Canada, and Mexico spanned two stints in public accounting, one in industry as an IT Auditor, a short one in Mazatlán with a Mexican research center in aquaculture and environmental management, and a more than 20 year run as a management consultant for three international consulting companies. In 1992 he sailed with his family in their 32-foot cutter from Canada to Mexico where they lived on the boat for almost two years. He has a long-running blog at http://prebenormen.com with over 900 posts, some of which have been republished by others. Before that he owned the site the Digital Norseman (now defunct) where, among other things, he published a handful of short stories. This, and two incidental articles published in the Viking Heritage Magazine about the replica Viking Ship ‘Munin’ built by the British Columbia Viking Ship Project for which he was the chairperson whetted the appetite for concentrating more deeply on writing. 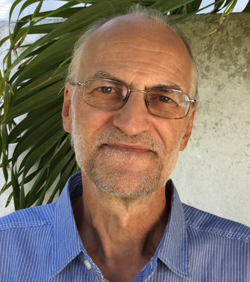 Preben is now retired from the traditional workforce and lives in Progreso, Yucatán, Mexico where he is finally dedicating his time to a long backlog of writing projects of which this book is a product. Preben is married with a grown daughter and spends his spare time taking long morning walks on the beach followed by a swim in the Caribbean Ocean, cooking, reading, and exploring his new home base, the Yucatán peninsula. I get ideas about stories, situations, and characters and enjoy putting them down for other to read. I plan my work in considerable detail and then write from that plan. This allows me to do individual scenes as sprints of no more than 2500 to 3000 words tops. In reality, final scenes range from 5-600 words to no more than 2500. I schedule writing time and try to put in at least 2 hours per day, more if I can fit it in. I have trained myself to get in flow quickly and start writing as soon as I have a blank page in front of me. I do spend quality time in edits, but find that if my plan was competent, the issues I deal with in edit are simpler. I outline on a whiteboard and in Scrivener's outline section. I also create character sketches – I have to know something about them before I introduce them. However, I also find that the characters grow on me as I get into the story and plot. Sit down and write. When you get stuck. Stop and make a plan now that you know what your problem is. The next time you sit down to write you will have something to work from and things will go smoother. I was too impatient to wait till I could find an agent or publisher to take it on, so I went directly to KDP Select. The downside is of course that I now have to do all my own marketing. It's a fiercely competitive market out there, so there's a price to pay in more ways than one to go solo. We will always want stories. Maybe we will redefine the meaning of 'book,' but something like it will probably always be with us. As authors, we have to be flexible and move with the media landscape. Printed books may be dripping off in some countries, but it's a big world out there. Lots of untapped potential even for print. Ebooks should be in a better position, but the holy grail may turn out to be audio.